WInning hearts and influencing minds. We are pleased to say the Buckeye Firearms has joined Ohio Carry and OFCC as cosponsors of the Patriots Day Rally. Nobody eats their own like the pro gun crowd and our rights are under attack like never seen in my lifetime. There are much more important thing to do than bicker with each other. I plan to be there, and will be bringing two of my like minded friends. received a nice email on this from BFA.. surprised it's the first formal contact I've seen on this event besides a facebook and forum post, and I did search for more info. 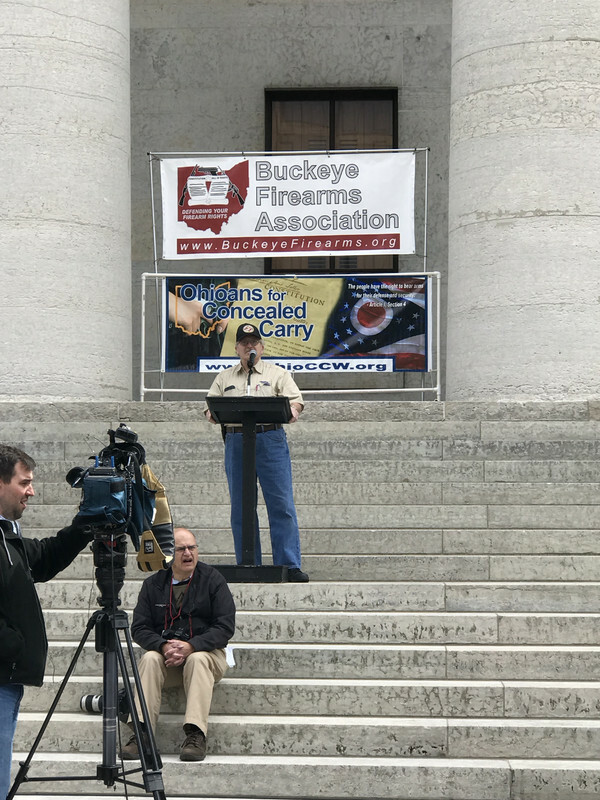 You are cordially invited to a rally for Patriotism and Freedom hosted by Ohioans for Concealed Carry, Ohio Carry, and Buckeye Firearms Association on Saturday, April 21, 2018 at 11 a.m. at the Ohio Statehouse, One Capitol Square in Columbus. Hear historical information on the role private ownership of firearms played in our country's founding. Hear immigrants talk of their experiences with freedom before coming to this country and their experiences now. Hear young people, the future of our great country, speak about why freedom is so important to their generation. CLICK HERE to tell us if you plan to attend. This is not necessarily an open carry event, but feel free to exercise your First and Second Amendment rights. * Dress neatly. Be polite. Show the world we're just ordinary Americans who love and respect our God-given freedom. * Bring American flags and other symbols of freedom. * This is NOT a political event. So please don't bring signs that insult candidates or political parties. * It's a family event, so bring the kids and celebrate our heritage together. Here are some sources to find parking in downtown Columbus. See you there!! Bring a couple with me, the more the merrier!! I'll be the fat guy with a mustache! Chuck wrote: I'll be the fat guy with a mustache! Surely not the only one! Saturday's Patriots Day Rally at the Ohio Statehouse is organized by three groups that oppose most gun regulations, including Ohio Carry, Buckeye Firearms Association and Ohioans for Concealed Carry. Gary Witt of Ohioans For Concealed Carry says the event, which begins at 11 a.m., is not necessarily a gun rally. He says it’s meant to celebrate freedom and honor those who fought for American independence during the Revolutionary War. An excellent event. Thanks to everyone who helped put this together. I thought the turnout was indicative of many of our brethren not taking the current anti-gun climate seriously. We had about 300 compared to about 60 or so one week earlier, and about 1000 five weeks before that. Several of the national group that was rallying one week before ours was complaining about ours, but the plans were made long before we ever heard of them; come to think of it, I never heard of their organization before then at all. Anyway, if one needs an excuse for the crowd size, one can use the fact that this was the third one in six weeks. Or, one can simply enjoy the fact that patriotism was running high and plenty of media got a first hand look at who we are. I think we put forth a valid cross section of gun owners who represents not just gun owners, but the average American here in the heartland.